Mystique is the name given for the ’66 Chevelle ground up restoration by Swag Custom Rides Inc., a non-profit automotive group from New Britain, Connecticut. Swag Custom Rides Inc. offer full restoration and customization services for a whole range of classic cars from Porsche to Chevys, and motorcycles. A pet project, Mystique has been transformed from the ground up from an aged ’66 relic to a modern hot ride. 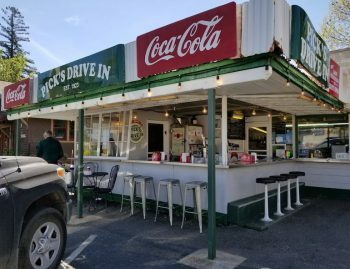 As explained by shop manager, Glenn Richards, restoration projects involving people who have had challenges, restores hope, teaches patience, and creates new skills. The program promotes new achievements and abilities. Professional auto technicians assist the recruits with engine building, body and trim finishing, and final finish and delivery. Working on classic vehicles is not easy, especially a project commissioned by keen collectors. Mystique, now finished, is displayed at this year’s 2017 SEMA Show in Las Vegas. The ’66 classic will now tour the USA collecting entries from enthusiastic hopefuls, only one will win Mystique as a prize. 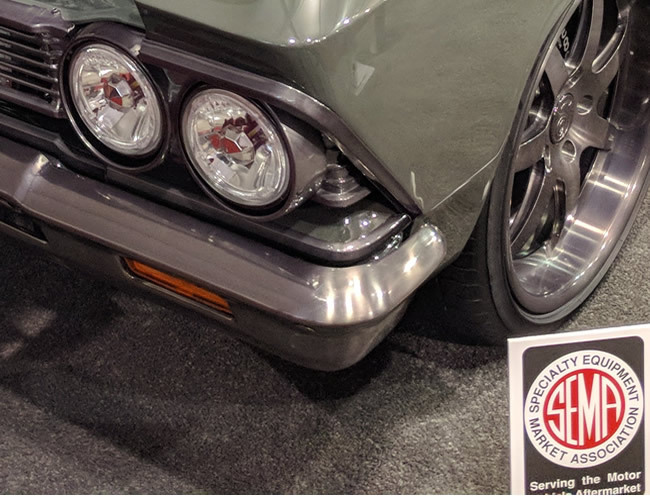 A ground up restoration, the 66 Chevelle features polished gunmetal effects from bumper to bumper including wheels, mirrors, grille and doorhandles. To achieve this effect, a dark grey translucent powder coating process is applied to all surfaces. For this process to consistently match on different surface types, chrome, aluminum, and nickel, varying surface preparations are required. Chrome is stripped and replaced with a nickel coating, the surface is brushed, then the powder coat is applied. The deep grey paint tone blends well with the gunmetal and red go-fast stripes. The color is fitting to the early car designs of the 1960s. 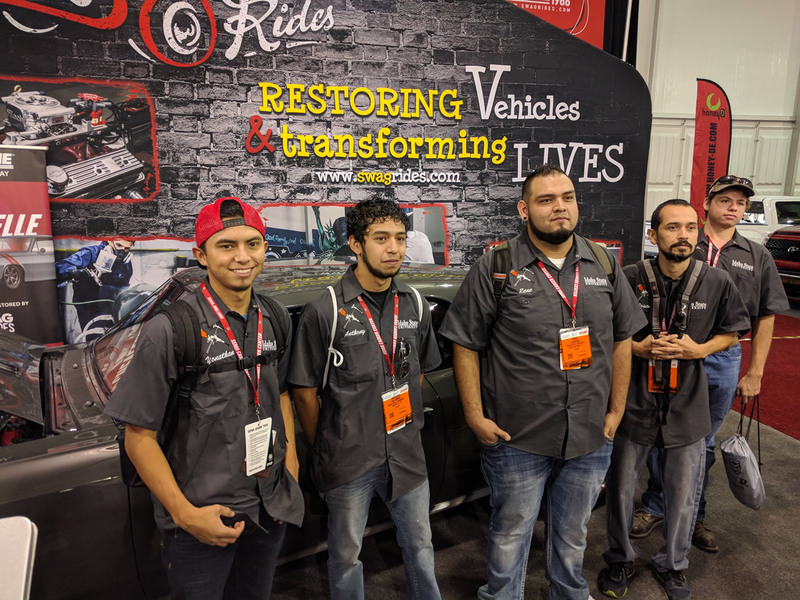 A group of techs visiting from Indiana State posed for a photo in front of Mystique at the 2017 SEMA Show. The cause brings much goodwill from technical comrades. 383 stroker ZZ3 600HP, aluminum heads. Gears: Tremek TKO 5 Speed with overdrive. Keep a watch out in your local auto shows for Mystique where you can visit the Swag Custom Rides stand and enter the competition for a chance to win this unique custom. Click here to find out how to enter for a chance to win Mystique ’66 Chevelle now! 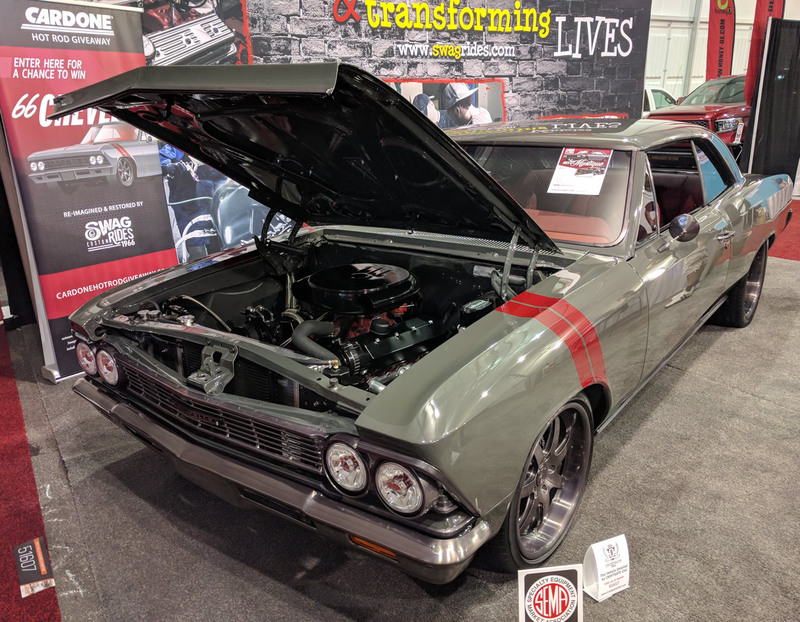 The Mystique ’66 Chevelle project was sponsored by Cardone – New and remanufactured replacements for your classic car or hot rod.